Oven-frying is a great way to create a thick, crisp crust on your meats without all the fat. Battered in an egg-spice mixture, then breaded and baked, these chops develop a delicious savory coating similar to that of deep-frying. Preheat oven to 350°F. Lightly grease a jelly roll pan. Beat the egg, soy sauce, water, garlic, and ginger together in a large bowl. Place breadcrumbs in a separate large bowl. 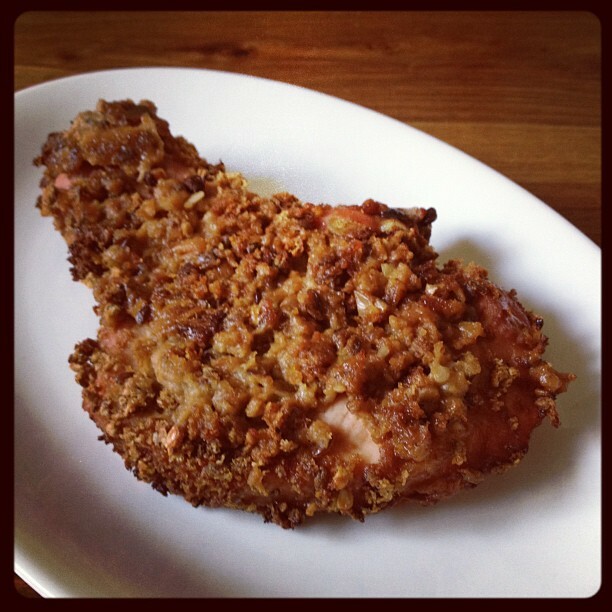 Dip the pork chops into the egg mixture, then into breadcrumbs, coating evenly on each side. Arrange in single layer on prepared pan and bake for 30 minutes. Turn and bake for another 20 minutes, until the chops are tender and no longer pink. They were great, definitely going to make them again. Delicious! Made for dinner tonight and will be making it again. Thanks for sharing recipe. I tried this but added a little hot sauce and a little sweet & sour sauce to the egg also Parmesan cheese and lemon pepper to the bread crumbs turned out great! Thanks for the recipe will use again. Used it tonight and it turned out great even the kids liked it and that surprised me. Will use it again! You can also add parmesan cheese in with the bread crumbs and garlic powder. I also use this on fried or oven baked fish and chicken. Give it a try, you'll love it!! DELICIOUS! This same recipe can also be used in a wok to deep-fry the chops or chicken strips. (Be careful of the cholesterol but when it tastes that good who cares). 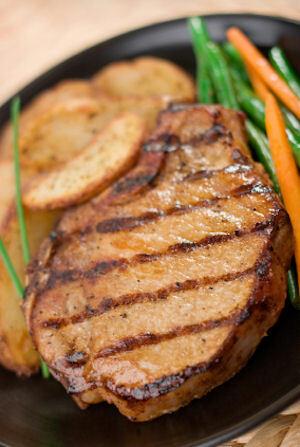 This is my favorite pork chop recipe so far, did not change a thing. I prepared it ahead, then put in oven later that night. I made it this evening. It was really easy and turned out nicely. This was very easy to do and very tasty! Breading stayed where it needed to, I used two eggs not one, I will use this recipe again. Thank you. Showing 10 of 23 total reviews and comments. Average rating of 4.24 stars based on 21 reviews. Summary: Oven-frying is a great way to create a thick, crisp crust on your meats without all the fat. Battered in an egg-spice mixture, then breaded and baked, these chops develop a delicious savory coating similar to that of deep-frying. A corn crumb crust speckled with herbs and spices create flavor-packed pork chops with a heavenly baked texture.